← Heading out on the hill Carn Chuinneag. Near Bonar Bridge. 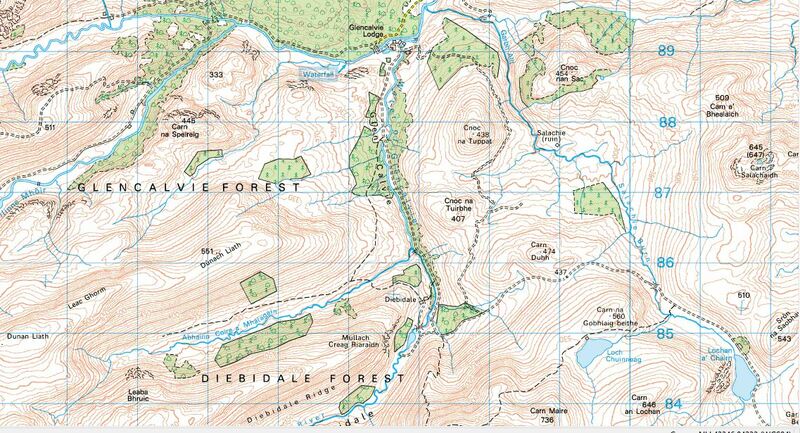 A hill and Glen with a sad history of the Clearances. A grand day on Carn Chhuinneag, magical hill, great paths the land of the Clearances and our sad history. I picked my pal Babs up at Dunphail and we put our Mountain Bikes in the van and away at 0700, so it was an early start for me. I had a snag with my back years of lifting and carrying stretchers have left it pretty bad at times. This was new Corbett for Babs and I had done it with a pal in 2011, since the bike would help with the Estate track. It was about a 2 hour drive to Ardgay/Bonar Bridge a grand trip once you leave Inverness and the views were stunning. The Struie hill is one I must cycle one day but not today, even putting the bikes on the car was sore. I took some pain killers and a heat rub but two and bit hours in the van does not help. From Ardgay you follow the river and the road this is fishing country and the toffs pay dearly for their right to fish the river. It is a stunning glen one I will return to cycle and looking green and lush all the way up the Glen. We left the van before the Lodge, there is a big clearing and then follow the Estate road which is well signed and an incredible situation. The river is a bit low in water but what colours the rocks are read and access for the fishing is excellent with gangways and the river banks looking so bonnie. We are now in Stalking season so it is worth checking on Hill Access on line with the estates a now simple process. Be aware that things can change due to weather and we all have to work together yet we have a great Access to the Wild places that has been fought so hard for, lets not abuse it. The back was sore but I only managed a few miles on the bike the bag hurting the heat and it was so close the heat overpowering so we left the bikes about 3 miles in I would have just been in too much pain. It was easier to walk after a stretch and wandered on along the track. Just as we got off the bikes I was ahead and saw an Eagle or Osprey by the river it was a superb site. The river rock has a red hue and with the trees this is special place and I am so glad we have access to the road/ track/ less travelled. I know a bit about the history of these glens and how to Scotland’s shame they were cleared and the families moved on the make way for sheep. It was true ethnic cleansing and an awful time for many. Those that survived many moved and emigrated and Scotland lost some of its finest folk. I felt a lot better walking off the bike and enjoyed the views our hill loomed ahead and we left the track past the big house at Diebidale looking like a fortress at the top of the Glen. The stalking path is a wonderful way up the hill as always it is great walking, how clever were those who made this path and up onto the ridge. I love the space and the colours and so few people . where the views opened out massive Corries and the far away Giant Munro’s. You could also see just sneaking through the clouds, old pals Beinn Dearg and Seanna Bhraigh. We found an antler on route on the way up but no sign of the deer! They must know that the shooting season is on. The way to the first summit means you have to cross of the path and over the most spongy ground ever through a boulder field then onto the first top.Babs loves the boulders (not) and then the mist came in and we had a wee shower earlier. The rocks were fine dry and easy to walk on a few moved but easier than the spongy ground off the path that is so well made we were addend to leave it. It was misty now with a bit of wind but we were soon on the ridge. The hill has two tops and separated by a ridge that reminds me of the Cairngorms and the tors are strange for arround these hill. The summit is full of Ptarmigan but no views today. This is normally a place of great views but not today and we did not hang about my back still sore and we wandered off the wrong side as I was not concentrating we soon sorted it out and contoured round easily. Today’s tip take a bearing in the mist, a silly mistake by me. The was an abundance of Interrupted Fir Club Moss on the side of the hill and more spongy ground and deep heather. Lots of signs of Deer but none about. We were soon down on the track picked up the bikes and nearly free wheeled all the way back. What an area and the Estate is looking after the land so well, new fences and gates and a lot of money being spent. We headed by back down the Glen passing 3 Mercedes Vans full of fisherman I wonder what the folk evicted would think of this place today? This entry was posted in Corbetts and other hills, Cycling, Enviroment, Flora, Friends, Health, Mountain Biking, mountain safety, Mountaineering, People, Plants, Recomended books and Guides, Views Mountaineering, Views Political?, Weather, Wildlife. Bookmark the permalink.